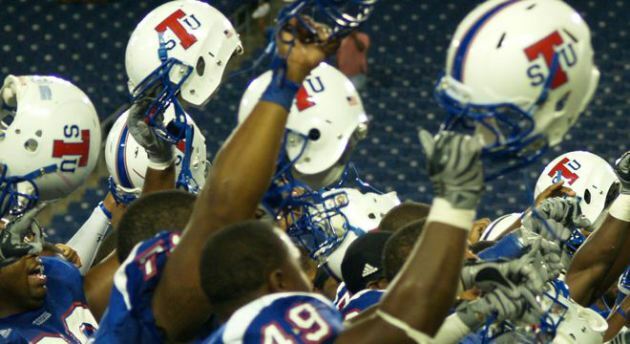 Tennessee State University, known as The Big Blue to its fans, won its 12th Black College Football National Championship in the 2013 season. They can now celebrate for another reason – the school was the only HBCU to have its athletes selected in this year’s NFL Draft. The Tampa Bay Buccaneers chose four-year starting guard Kadeem Edwards in the fifth round as the 143rd player picked overall. The St. Louis Rams chose center Demetrius Rhaney in the seventh round, the 250th player taken. Two other Big Blue mainstays, tight end A. C. Leonard and free safety David Van Dyke, signed free agent deals within hours of the draft end on Saturday. Edwards, 6-4, 313 pounds, and Rhaney, 6-2, 301 pounds, anchored the offensive line for Tennessee State as the Big Blue advanced to the second round of the FCS playoffs for the first time since 1999.